Terri Hobbs moments after being honored by the Housecall Providers staff. It’s a handful of people across America who have worked tirelessly within the last two decades to bring the house call back from near extinction. Among the members of that elite group: Terri Hobbs. The former executive director of Housecall Providers gave her blood, sweat and tears the last 16 years to ensure that, above all else, home-based medicine would survive in Portland. There were years when it seemed that desire would only be a dream amid the uncertainty of public and private support and the shortfall, growing larger each year, between what a house call “costs” and its reimbursement rate. It was in then that the organization’s resilient spirit shined forth. Sacrifice was a necessary element for survival back then. Staff accepted what needed to happen because they knew what was at stake. On top of managing the business, between 2007- 2010, Hobbs was also in charge of the billing department, community resources and fund development. In 2011, she became executive director as Founder Dr. Benneth Husted stepped back. According to Hobbs, what she is most proud of is the impact that Housecall Providers has had locally as well as nationally. With Housecall Providers now part of the CareOregon family, it has what it needed all along: a like-minded partner. CareOregon not only knows the vital role house calls currently play within our community, but also the enormous potential they have to be an agent of change within the health care system for years to come. 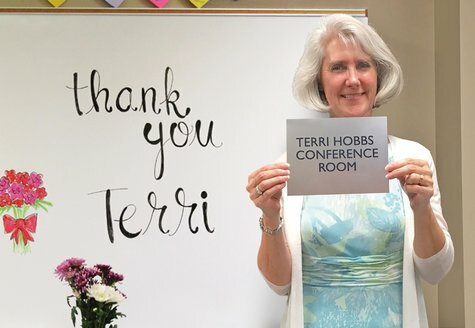 Staff and board members who have worked with Hobbs the last 16 years know that it was because of her compassion for and commitment to the patients that gave her the courage to do whatever was necessary to keep the service viable. Last month they paid tribute to her with a celebratory luncheon honoring her years of service. Ramsay’s remarks echoed the thoughts of many in the room. After taking some well-deserved time off, Hobbs plans to reengage in her support of home-based primary medical care working locally and nationally towards the goal of seeing IAH become a Medicare program. Thanks to Hobbs, that care could likely be delivered by Housecall Providers.